Prior to beginning the exploration of Alfred’s War, discuss with the learners the importance of Acknowledgment of Country. Advice about constructing an Acknowledgement which is relevant to your context can be shared with the learners, and you can jointly construct an Acknowledgment that your class can use at appropriate times. If you have Aboriginal or Torres Strait Islander learners, this also provides an opportunity to learn more about them and provide an inclusive learning space. What might we already know about the ANZACs? Alfred’s War positions the reader as an observer, as readers look on to the lonely life of a World War I ex-serviceman as he wanders his country, remembering his fallen mates and doing his best to ignore the pain of a wartime injury. The reader comes to realise that this life is, for the most part, a consequence of the Australian Government’s failure to recognise Aboriginal service men and women when they returned from active service. Before exploring the historical and personal aspects of this beautiful book, it is important to first explore what students have learned previously about the ANZACs and whether they have any personal stories of family members being in service. This collective knowledge will set the context for deeper learning about Alfred and other Aboriginal soldiers. We are learning to listen and share our knowledge. We will know if we are successful when we can summarise key points from our group and class discussions. Prior to reading Alfred’s War for the first time, find out what knowledge and experiences the students have by doing a brainstorm and then sorting the information shared into a class chart. Explain that you are going to be sharing a text about the ANZACs in World War I and you want to find out what everyone already knows about this topic. Organise students into pairs, providing each pair with strips of paper. Ask them to write any information they know about ANZACs and write one sentence per strip of paper. Remind them that all information is valuable, whether it is something they have learned at school or outside of school. Can someone summarise what has been said? Would anyone like to respond to that? Can anyone give an example of that? Can you go a bit further? Who were the soldiers from our local community? Some students may have already shared some of their family histories while others may have had no personal connection with enlisted men and women. Students will have varied experiences of what it means to remember those who have served and those who have fallen. One of the common ways we remember and indeed ensure we do not forget is by erecting memorials. The following activity will allow you to find the memorials in your local area. If you are able, it is suggested that you visit some of these. Otherwise, they can be accessed online. We are learning to use a website to explore our local community. We will know we are successful when we can share at least three facts from our research. For this online search, you may like to follow an ‘I do, we do, you do’ structure for the lesson so you can model navigating the website. Go to the RSL Virtual War Memorial. Locate the ‘memorials’ horizontal menu bar then type in your location where it says ‘Search by place’. On the map, you will see symbols for any memorials nearby. If you click on a symbol, more information will appear to the right of the map. If you click on details, a drop down information window will appear, which includes an image, description of the memorial and information about its purpose and any inscriptions. It is important that you take some time to explore this before modelling with the students. What kind of information is provided? Which war does the memorial relate to? What does the inscription say? What are the similarities and differences between the inscriptions? How many people are listed? What do you notice about the names? What do you think the purpose of the memorial is? What would it be like if we didn’t remember? To record students thinking around this topic, print out images of the memorials and have students annotate the images with their research. Alternatively, they can record digitally on tablets using an app such as bookmaker or on a PC using PowerPoint. The Australian War Memorial has a series of Memorial Boxes which contain uniforms, equipment, artefacts and information about individual soldiers. Memorial Box 3 is specifically about the experience of Aboriginal and Torres Strait Islanders and their contribution to Australia’s defence services. For this activity, you will need to pre-order a Memorial Box from the museum from the list of museums around Australia who hold the Memorial Boxes. The Memorial Box website also includes resources such as videos which should be accessed in preparation for this activity. You may also access the biographies in the further resources section. There are five soldiers from World War I: Daniel Hodgekiss SA, Harry Murray QLD, Wiliam Rawlings Vic, Douglas Grant QLD/NSW and Richard Kirby NSW. Choose the one that is most relevant for your students. We are learning to empathise with others. We will know we are successful when we can describe the experiences of others from another time and place. What would it feel like to be a soldier? Choose at least one biography from those provided on the Memorial Box website. Explain that you will read aloud a biography of a soldier who fought during World War I. Tell the students that while they are listening, you want them to think about three things that relate to soldiers: skills, conditions and mates. Pause and share inferences that you make from the text as a think-aloud – clarifying vocabulary as you go. At the end, write some of the key vocabulary on the whiteboard so it is visible to everyone. Divide students into three groups. Provide each group with a large sheet of paper. Each sheet should have a different heading: skills, conditions, mates. Each group brainstorms what they think about their topic for 5–10 minutes. At the end of this time, the sheets of paper are handed on in a clockwise direction so that each group receives the previous group’s brainstorm. They then have another 5–10 minutes to read the ideas and add to them. Continue the same process so that everyone has a chance to contribute to each topic. This can also be done with the sheets of paper stuck on the wall in different parts of the learning space, and the groups of students move around to the different spaces. Choose whichever way best suits your context. As a whole class, review the collaborative notes and orally summarise what has been recorded. Ask the question: When we think about the ANZACs, what do we remember about them? Allow students to turn and talk to a partner before opening this up to a discussion. Record responses in a class journal or anchor chart. During these initial lessons, students have had the opportunity to connect to prior knowledge, to explore some of the memorials in their local community and consider the experiences of soldiers during World War I through hands-on learning. This assessment task is an opportunity for the students to reflect on their learning and decide what has been the most significant for them. In order to do this, they will record their thinking in their reading journal. We are learning to build our understanding through reflection. We will know we are successful when we record our thoughts in our reading journal. Explain to students that for this next task, they can access their previous notes and any charts or summaries that have been made as a class. 3 things that they have learnt. 1 thing that surprised them. When students have completed their journals, ask them to add their questions to a Wonder Wall. 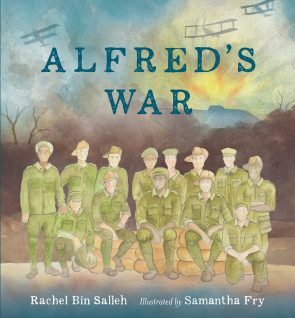 Now that the students have had an opportunity to develop shared contextual knowledge and understanding, introduce to them the picture book, Alfred’s War. Making Predictions: What is Alfred’s War about? We are learning to make predictions about a text. We will know we are successful when we can use words and images to support our thinking. Divide students into small groups and give each group a photocopy of the front cover of Alfred’s War. Ask students to think about what they have learned about the ANZACs and to consider what they see on the front cover. Ensure each group has a scribe and a reporter who will report back to the class. Provide each group with a retrieval chart to complete, like the one below. What kind of text might this be? What time period might the story be set in? Where might the story take place? Who might the characters be? To ensure that all students can successfully engage with this task, use an ‘I do, we do, you do’ strategy by modelling how to complete the first row in the table. For example, the genre might be historical realism because there is a group of soldiers and a war scene in the background. Guide the class to complete the second row. You could then have half of the groups complete the third row and the rest complete the fourth row or everyone complete the remaining rows. Ensure that each group has a chance to share back and everyone’s thinking is collated. Read the text to the class and discuss what was as predicted and what surprised the students. We are learning how narratives can help us to understand historical events. We will know we are successful when we can compare events in two different texts. For this learning activity, your class will view a news item from SBS about the charge of the Light Horse Brigade at the Battle of Beersheba. To ensure all students can access the information in the video, lead the students through the below before, during and after viewing activities. Keyword discussion – traffic lights. Provide each student with a list of key vocabulary and the traffic light template (PDF, 169KB). Key vocabulary: ancestor, spirit, Defence Act, Aboriginal Protection Act, armed forces, outbreak, answer the call, enlist, connivance, a pivotal role, troopers, second-class citizens, wreath. red – this word/phrase is new to me. I don’t know what it means. orange – I have heard/seen this word before but I don’t know what it means. green – I know this word and I can use it. Once students have completed sorting their vocabulary, lead a discussion where students support each other to understand the vocabulary. For example, if one student has an unknown word, allow another student to explain what it means. Only step in if students need clarification or if there are words that none of the students know. Read Alfred’s War again. Explain to students that they are going to compare Alfred’s War to the story in the news video about the Battle of Beersheba. Allow them to take notes while viewing – pause the video on request. Jointly construct notes on the similarities between the two texts. Invite students to record the notes in their reading journals. Often students need support to understand the difference between plot and theme. The plot is what the story is about – what happens. The theme is the significant message in the story. For this activity, students’ understanding will be developed through the co-construction of anchor charts, and then the exploration of social distance and the use of colour to develop the themes of loss and exclusion in Alfred’s War. We are learning to use dialogue to build deeper understandings. We will know we are successful when we can orally explain a concept. For this activity, you will need a large piece of chart paper and some coloured markers. Divide the chart paper into two columns and write ‘plot’ on one side and ‘theme’ on the other. Addressing the whole class, ask them what they think a plot is. Allow them to test their ideas with the student sitting next to them. Who would like to share their initial idea of what a plot is? Would this answer apply to all stories or just Alfred’s War? Does anyone disagree with this idea? Does anyone have any more to add? Who thinks they can summarise what a plot is? What would be the best way to record our thinking on the anchor chart? Repeat the same process for theme. You may like to ask questions which require the students to compare and contrast plot and theme. By the end of this process, you should have an anchor chart which clearly defines plot and theme in the students’ own language. Once you have completed this, ask: what are the themes of Alfred’s War? We are learning that the choices illustrators make add meaning to a picture book. We will know we are successful when we can talk about the meanings made through images. For this activity, you may need to introduce some meta-language relating to visual grammar, specifically the way in which the reader interacts with the characters in the text. When a character is drawn front on, directly facing towards the reader, with their gaze seeming to meet the gaze of the reader, this is known as a ‘demand’. It is called a ‘demand’ because the character is demanding the attention of the reader and there is direct interaction between the reader and the character. Close-up and extreme close-ups of characters’ faces intensify this relationship. However, when a character’s gaze is averted, that is, has his or her eyes looking away from the reader, this is known as an ‘offer’. In this case, the reader is invited to observe a scene as an invisible onlooker. The reader is not involved but in some way bears witness to the events. In Alfred’s War, all of the images are offers. The reader looks on into Alfred’s lonely life as gradually the reasons behind the loneliness are revealed. The only image which comes close to a demand is on the front cover when Alfred is sitting amongst his soldier mates. His gaze is not direct but slightly averted, almost as if he is looking over the shoulder of the reader. In this image, Alfred is equal to the others, has a sense of belonging and a clear purpose in life. In the other images, all of this has been stripped away. Particularly poignant is the image where Alfred walks along a path towards the reader, walking on despite the pain in his ‘gammy leg’. Even though he is fully facing the reader, his gaze is covered with his hat pulled down over his eyes. One interpretation of this particular aspect of visual design could be that Alfred has chosen to disengage as a result of how he has been treated. He has not received the same rights and recognition as the non-Aboriginal soldiers; he has been excluded from society and so he has disengaged with human contact. What kind of interaction occurs between the reader and Alfred? Explain using the terms ‘offer’ or ‘demand’. Why do you think the illustrator has chosen to draw Alfred in this way? What is the impact of this interaction on the themes of exclusion and lonliness? Colour has an impact on the mood of a narrative. The meanings that colour can evoke are culturally bound and so differ across cultures. Provide the students with a colour chart and discuss the meanings often associated with colour in Western culture and then explore whether students have similar or differing ideas about colour. The predominant colours in Alfred’s War are blue and grey. These colours impact on the mood of the story, once again enhancing the themes of exclusion and loneliness. Divide students into small groups, and with a colour chart and one or two pages from Alfred’s War, ask them to record what colours are used and how the colour helps to communicate the theme of the story. We are learning to use complex sentences to respond personally to a text. We will know that we are successful when we can express our feelings about a text using complex sentences. To prepare students for this task, ask them to think-pair-share what emotions they felt when reading Alfred’s War. Students should be specific about how their emotions changed in relation to different parts of the story. I felt sad when Alfred was sleeping on the bench. I felt angry because Alfred was not welcome in the towns. When Alfred was sleeping on the bench, I felt sad. Because Alfred was not welcome in the towns, I felt angry. Note that when the conjunction comes at the beginning of the sentence, there is a comma after the first clause. Provide a few more conjunctions: due to, while, as a result of, as, as long as, even though. Work with the students to brainstorm a list of affect adjectives. Students may want to research online or look up synonyms. Allow them to practice writing complex sentences on strips of card, using conjunctions and adjectives. Ask students to choose their favourite sentences and display them on the wall. Responding to one part of the book, jointly construct a paragraph with the students. Once students are confident, ask them to write one or two paragraphs in their reading journals about how they feel about the book, Alfred’s War. Make it explicit that you will be looking for their ability to respond emotionally to the text using affect adjectives and conjunctions to make complex sentences. We are learning about how plot structures engage a reader. We will be successful when we can explain how a plot structure works. In this activity, students will be exploring the flashback structure in Alfred’s War. By Year 6, most students will be familiar with the orientation ► complication ► resolution narrative structure. Begin this activity by asking students to think-pair-share what they know about narrative structure. Explain that they are going to learn about a different way to structure a narrative. You will need a large space either outside or in a gym. Construct two parallel lines about 3 metres long and 1 metre apart. Either draw the lines with chalk or use masking tape. Print two copies of the key events in Alfred’s War template (PDF, 184KB). These can be laminated or printed on card. Cut out the different events so each is on a separate card and mix them up. You will also need three different coloured dot stickers. Place the heading ‘Sequence of Alfred’s life’ above one of the lines. Divide the class into pairs and give at least one card to each pair. Explain that they need to place the cards on the line in the order of Alfred’s life from when he was youngest to oldest. Stand back and allow the students to work this out. Once they are sure they have the cards in sequence, clarify any misunderstandings, then use a marker to number each card from 1 to 13. Above the second line, place the heading ‘Sequence of Alfred’s War’. Hand out the second set of cards. This time you will read the story aloud while students place the cards as the events occur in the book. Pause after each key event so the students have thinking time. Once all of the cards are placed on the timeline, number the cards then colour code the events according to what happened before, during and after the war. Ask the students to think about why the story is sequenced differently to Alfred’s life. Explain that a flashback is when a story takes the reader back to a previous time. Ask students to identify which events in Alfred’s War are flashbacks. As a class discuss why the author has chosen to use this structure. How does it help the reader to understand Alfred? How does it help the reader to understand the injustice that happened to Aboriginal soldiers? Students need to understand that the structure works to help the reader understand how the old man portrayed at the beginning of the book came to be all alone, walking the countryside. By beginning the narrative with Alfred’s life after the war, the reader feels sad and wonders why this man is all alone and living outside. It provokes curiosity and interest in what happened before in this man’s life. Take a photo of the timelines and print a copy for each student. In their reading journals, invite students to annotate the photo, summarising what they have learned through creating the timelines. We are learning how authors use sentence structure for effect. We will know we are successful when we can identify sentence types and suggest what effect they have. Sentence fragment: a grammatically incomplete sentence which doesn’t contain a verb. Simple sentence: one clause with one verb. Compound sentence: two or more clauses joined by a coordinating conjunction e.g. and, but, so, yet. Each clause has a verb. Complex sentence: a sentence with two or more clauses, each with a verb, joined by a subordinating conjunction, a non-finite verb or a relative pronoun. The table below provides an analysis of the some of the sentences in Alfred’s War. Each verb group is highlighted in green to support the analysis. Construct a table like this with the students. Decide how much of the table you will have filled in and how much you will co-construct, depending on the students’ needs. This activity requires some direct teaching, as you guide students’ thinking when analysing each sentence. When you feel confident that students understand how to recognise a sentence type, you may ask them to work on some sentences in pairs and then independently, coming back to the whole group to share and discuss. Alfred George lived outside. Simple A limited amount of information provided to the reader. Visuals support the information and provide more detail. He slept in parks. Simple As above. On benches. Fragment A circumstance of place providing more information about where Alfred sleeps. Used to pace the narrative, slowly revealing information about Alfred. Under big trees. Fragment As above. Always under the stars. Fragment As above. The word ‘always’ emphasises the fact that Alfred sleeps outside. Sometimes Alfred rolled up his bedding and walked from town to town looking for work. Complex Two clauses joined by ‘and’. The last clause joined with a non-finite verb looking. ‘Sometimes’ indicates a change in events and these are elaborated on with a complex sentence. Always with his hat on, his billy tied to his swag and holes in the soles of his shoes. Fragment The subject of this fragment is Alfred and he is not mentioned. This fragment provides more information about the previous sentence. It is a circumstance which tells how Alfred walks from town to town. At night, Alfred camped on the outskirts of town. Simple Slowly revealing more information. ‘At night’ indicates a change in time. There were many places Aboriginal people weren’t allowed to go. Simple Revealing two facts: 1. Albert is Aboriginal, 2. There were different laws for Aboriginal people. That’s [how life was in those days.] Complex The second clause is embedded. Once again, a statement of fact. This is not something Alfred was choosing. Alfred had grown up on a mission and, when he was old enough, he set off to find work. Complex The perfect past tense indicates that the narrative is going back to a previous time period. The sentence is longer, containing an interrupting clause as it is providing more descriptive information about Alfred’s life as a younger man. He worked as a gardener and a labourer, and mustered cattle on stations a long way from home. Compound Lists the jobs that Alfred had. Compound sentences are useful for providing lists of things. One day, Alfred wrote a letter to his family, telling them he had signed up for adventure and travel. Complex This sentence has three clauses, the second is non-finite, the third is projected (the word ‘that’ is omitted). ‘One day’ at the beginning of the sentence indicates a change in events. The complex sentence reveals Alfred’s thinking and provides reasons not just facts. Most of the remaining text uses compound and complex sentences as it describes Alfred’s experiences of war and his experiences upon returning to Australia. The final sentence stands alone. The writer once again chooses a simple sentence to state a simple fact: He was one of the forgotten soldiers. While we often teach students to write more complex sentences to express their ideas across the curriculum, it is important that they begin to recognise the author’s craft in pacing the story and making significant points of historical fact through careful choice of sentence structure. After class discussion and completion of the sentence table, ask the students to choose two or three of the sentences and write a short reflection in their reading journals about Rachel Bin Salleh’s choice of sentence structure in Alfred’s War. We are learning how to analyse and annotate a text. We will know we are successful when we can suggest reasons for an author’s choices. For this activity, the learners will have an opportunity to read other picture books about ANZAC Day. There are many texts available, although Aboriginal veterans are generally under represented. You may wish to point this out to the learners, or you may wait to see if they notice this themselves. Either way, it is an important point for discussion and an opportunity to debate why this is the case. Using a picture book about ANZACs of their choice, ask students to photograph some pages from the book (the amount may vary depending on the ability level of the student). Using the app Explain Everything, students highlight aspects relating to narrative structure and/or sentence structure. Students can write their interpretations or record their oral interpretations. Creating a multimodal narrative within the genre of Historical Realism. In this final part of the study of Alfred’s War, students will take what they have learned in the previous lessons and put it together to create a digital narrative. They will develop a flashback plot, illustrate their character using offers or demands and write a brief story using simple compound and complex sentences. They will compose this using Storyboard That. It is important that you take the time to become familiar with this software before introducing it to students. We are learning to summarise keys points from a text. We will know we are successful when we have least three points for each heading in our note-taking proforma. For this task, you will need to access the biographies of World War I soldiers on the Memorial Box website. Students choose one soldier to create a narrative about. They read the biography and take notes about their life using the flashback plot proforma (PDF, 177KB). Students only need to record two to three points for each time period, as they will be creating a short storyboard of up to ten frames. Once students have written their notes, they can write them into a draft storyboard (PDF, 111KB) in the bottom row. The first blank row is for information about images which they will complete in the next activity. We are learning to create characters for a narrative. We will know we are successful when we can develop a character in different ways. Using their storyboard template, students make notes about what will be included in each image. They need to decide whether the image will be a long shot or a close-up, whether it will be an offer or a demand. Students will also need to decide what colours they will use. As students will need to develop an image of their character to upload into Storyboard That, drawing tutorials on YouTube may be useful. Once students are comfortable, have them draw their character in both a close-up and a long shot, using both demands and offers to interact with the reader. We are learning to write for a specific purpose. We will know we are successful when our writing meets the given criteria. To differentiate, provide appropriate support for students, particularly those students who are not yet proficient in Standard Australian English. We are learning to reflect on our learning and present our thinking to others. We will know we are successful when we can evaluate our own learning. Do they think their stories are effective? Which aspects of the story, visuals and language choices worked the best? Why do they think so? Which aspect of creating the storyboard did they enjoy the most? Why? What have they learned from this process? What else would they like to learn about? Ensure you make it clear how you want the storyboards to be presented and make clear the expectation for a formal presentation style. You may need to model this and create anchor charts with the class for formal presentation and informal presentation so that the expectations are explicit. You could also provide students with criteria sheets so they can provide peer feedback. Memorial Boxes: This Memorial Box explores the unique wartime experiences of Aboriginal and Torres Strait Islander people, and their significant contribution to Australia’s defence. Personal stories: There are several case studies. Each contains a personal story, as well as suggested activities for research and classroom discussion, and relates to the hands-on objects you will find inside your Memorial Box. Bev White is Manager: EALD and Literacy programs for the Department of Education in South Australia. She previously worked as leader of Learning at Kaurna Plains Aboriginal School. Prior to that, she was an EALD Consultant for many years. Bev is passionate about all students accessing the curriculum, through intentional and explicit teaching which engages active and reflective learners.